In the first of our psychedelic culture series, Brief Trips on Psychedelia, Nikki Hall muses on Hermann Hesse’s novel, Steppenwolf. The problem with our curious youth and mature intelligentsia is the luxury of self-examination. For example, I cannot remember the first time I read Steppenwolf. Perhaps I never did. But I did spend the past two decades in deep solipsism aided by university, a creative life, and the Internet. For those reading Hesse’s oft-misunderstood 1927 novel today, beware of having your own solipsistic tendencies exposed. The book’s premise for its time is prophetically psychedelic: psychedelic” meaning (derived from ancient Greek) “soul manifestation or revealing”. Steppenwolf aka Harry Haller -a literal Freudian Wolf Man - drifts through life in an intellectual, anti-bourgeoisie haze where his intense dissatisfaction with reality is tested by a treatise and a Magic Theatre intended FOR MADMEN ONLY. Prophetically, after the conventional, white picket fenced 1950s, Steppenwolf became a spiritual handbook of sorts for 60s and 70s counterculture America. The last part Leary is referring to Haller/Steppenwolf’s closing carnivalesque descent into supreme madness similar to schizophrenia. The spectacle – a creative form of soul manifestation – encourages us to self-examine and transform through carefreeness and humor rather than darkness and despair (“You must apprehend the humour of life, its gallows-humour”) and to accept the multiplicity of our personas (“all the hundred pieces of life’s game were in my pocket”). However, to an inexperienced reader – in acid trips, breakdowns, or literature, the overarching message of healing through transformation gets lost. For me, Steppenwolf is not just a thinly-veiled, mystical autobiography, but a profound book. A manifesto for the marginalized, the tortured, the spiritually hopeful for kindred spirits. After recently losing my own kindred spirit to an overdose, Haller’s soul twinning with Hermine – a physical manifestation of his feminine soul – reminded me of the significance of finding your soul sibling: “I am a kind of looking-glass for you, because there is something in me that answers you and understands you.” This could also be understood as human self-reflection– we are many spiritual multitudes, we just have to look within and not outward for contentment. 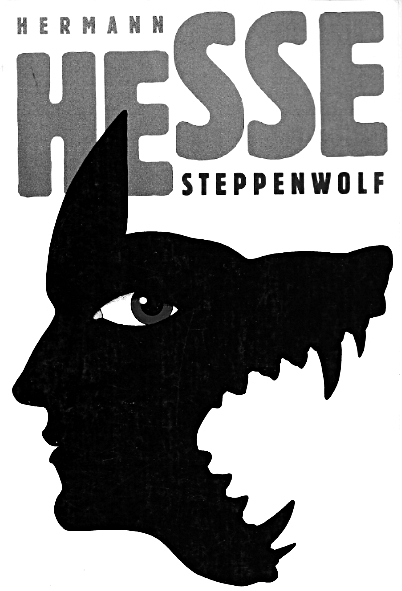 Hesse wanted Steppenwolf to be read by those like him. Not necessarily male, but those who were older. Revealed in the author’s note, written in 1961, 36 years after first publication, Hesse writes: “Written when I was fifty years old an dealing, as it does, with the problems of that age, often fell into the hands of very young readers.” Yet his most autobiographical novel is more suitable for rebellious, progressive youth who are frustrated by the conservative – sometimes misunderstood – values of the previous generation. Hesse also echoes Theodore Roszak. Roszak, who published his influential ‘Making of Counterculture’ in 1968, wrote with caustic truth: “There is nothing whatever in common between between a man of Huxley’s experience and intellectual discipline sampling mescaline and a fifteen-year-old tripper whiffing airplane glue until his brain turns to oatmeal.” Note: Hesse, himself, never took any hallucinogens. He was just sharp. How could a German shape American culture so much? Because the text is ageless. Haller is a man in a nondescript place, experiencing life’s complete spectrum from love to hate, rebirth to death. It speaks to the disaffected in middle America to the cultural capitalist coastal states. Today, it is for those who are relentless in the self-improvement via ayahuasca ceremonies in Peru; or those entering the “magical theatre” of the web, where you can shatter yourself into a million personas. For Hesse’s prefered fifty pluses, who are lost and disillusioned by our ever advancing technological age, where is there hope of transformation? I straddle somewhere between the two. Despite my increasing Ludditism – too much knowledge, not enough depth – I never will lose my optimism for our tech bounty which will somehow help to liberate our spiritual selves: free, pirate copies of Ram Dass’ Be Here Now and online self help seminars led by Eckhart Tolle, anyone? Unfortunately because of this, I predict Steppenwolf will remain largely unread– and misunderstood by most that do.